Then it came to me. Sneaky Gitz! With just a little bit of clipping and greenstuff I made these 10 SGs. Althought they have been nerfed by 7th Edition, they may make interesting additions to my force (have on free Special slot) and with all those poisoned attacks, who's going to argue? 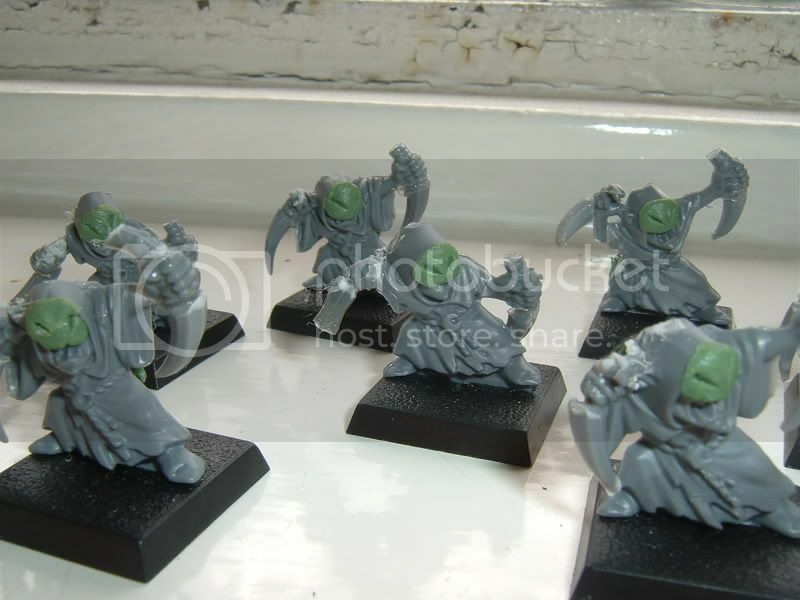 Anyway here are my little green ninjas, they will be painted black except for the green poison on there blades, the blades themselves and the death masks. Any suggestions for the colour for them? Damn nice idea! Are those daggers part of Forest Spider legs? Sorry I forgot to mention the daggers! 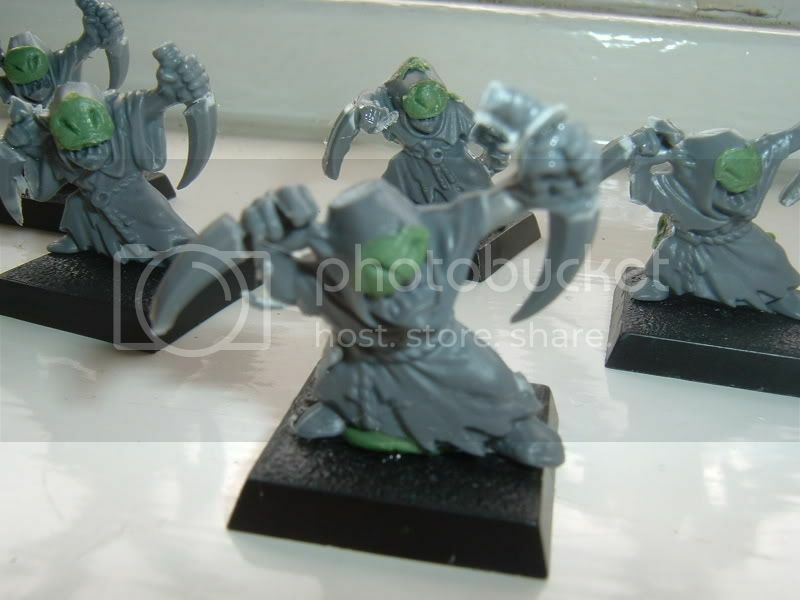 They are made from pickaxes from the dwarf miners, I bought a 10 man box last week and had a few lying around. Ok, got some by myself too . Gotta make some. I was wondering what I was going to do with my Archers. This is a perfect fit, pose-wise. Well done, sir! This post was last modified: 07-30-2007 11:06 AM by Xander. Why couldn't you have posted this three days ago when I still had my BFSP archers? Sorry, I have thought about how to do them but I only had enough miner picks 2 day ago. Any idea on the mask colour? EDIT: Oh and Xander, you're welcome to them. This post was last modified: 07-30-2007 11:12 AM by Nemo. Same as the rest of the clothing, I'd say. Thanks for all the positive replies guys! Check the Code Reference section for help. Resized for you Nemo. Hope it looks okay. Awesome, thanks cornixt. 1000 Slaves to you! Bravo again on a bit of ingenuity! I will be combining my Hobbo style with this for Sneaky Gits of my own. Those are great Nemo, it seems to fit so perfectly. Someone, on HoH, a VERY long time ago, had used the bows and goblins, but filed the lower OR upper half and clipped off the other to make curved daggers.